I really like the way the padding emphasizes the bars and the face. The only thing that I’m not totally happy about is the wonkiness of the edges all around. I’m going to try steam-blocking it sometime this week, to see if I can make it more rectangular. The colors in each small area are unified enough to look “solid” at a distance, but close up, they become streaks of many related colors. That’s because I used three yarns, each with a different fiber content, in each warp. The silk, mercerized cotton, and unmercerized cotton all “took” the dye differently, adding variety to what might otherwise have been a solid blob of color. 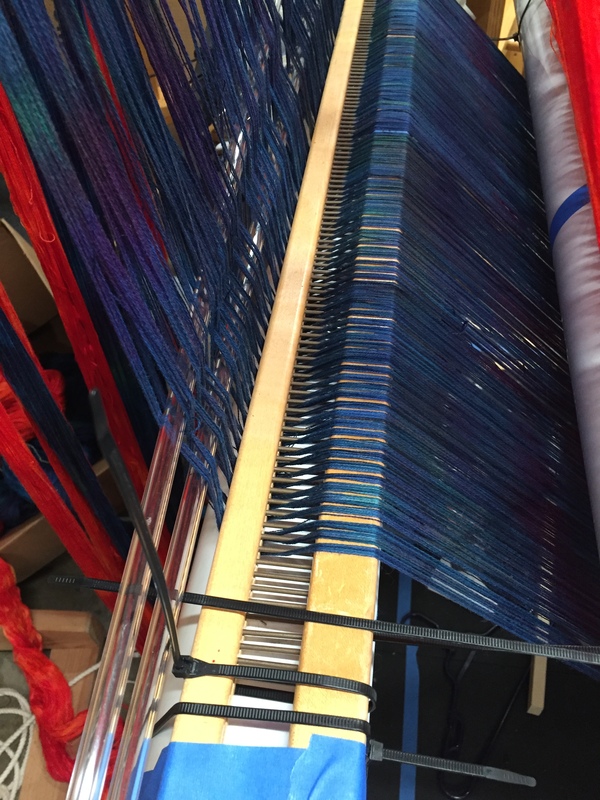 The warps also have rich texture to them – physical as well as visual. The three yarns are all different sizes, and are threaded randomly in groups of four, adding a bit of textural interest. 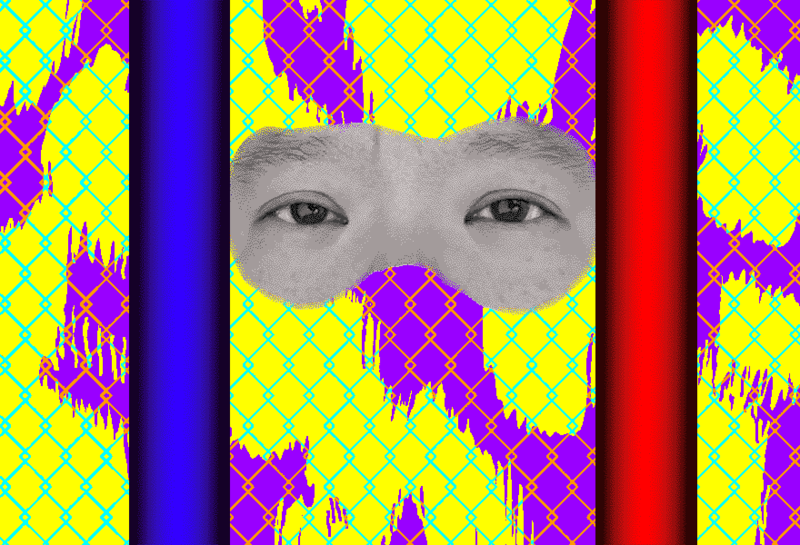 I also added some subtle squiggles in the background (“behind” the chain-link fencing) to break up the solid patches of color into something more visually interesting. The one thing I haven’t figured out yet is how to mount it for hanging. While the padding is perfect for the design, it also distorts the outer edge of the piece, drawing it into unsightly puckers. This would seem to be a good reason to frame it – that way, it could be stretched into a rectangle and pinned in place. But framing is expensive, bulky to store, and expensive to ship. Since I’m planning to send this piece to shows, I’d much rather be able to roll it up and ship it. So if you have suggestions for how to finish and hang this piece to get a rectangular edge, please leave a comment and let me know! 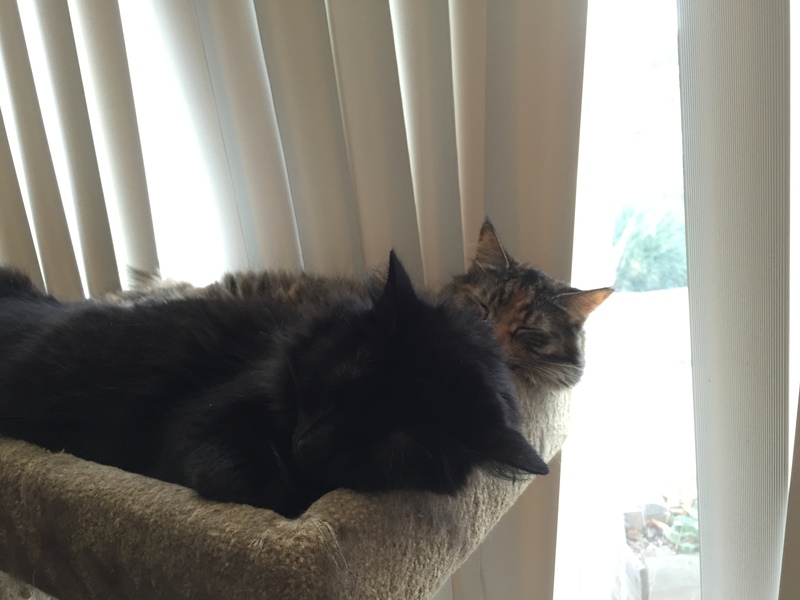 So here are Fritz and Tigress, engaged in their favorite Olympic sport: synchronized sleeping. 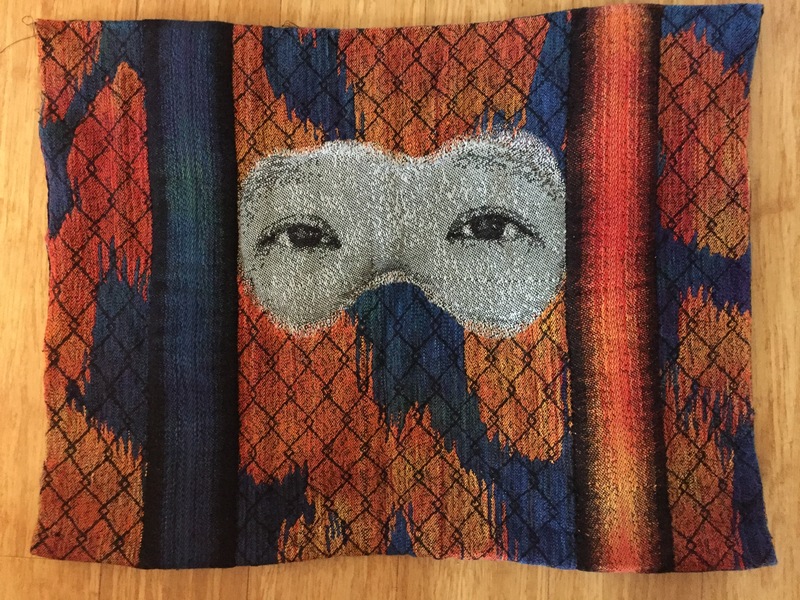 I finished weaving “Bipolar Prison” this morning, and added some padding to the bars and face. There’s still quite a bit of work to do, but I like it! 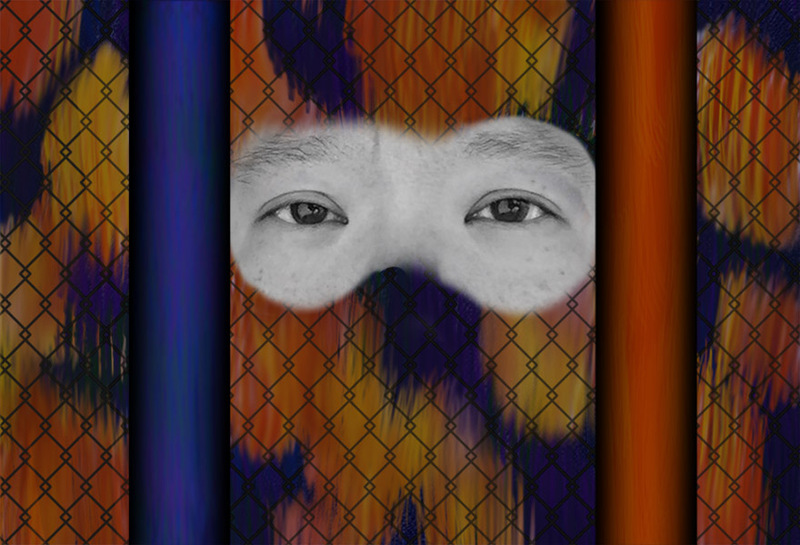 I decided to pad the bars and the face because I wanted them to stand out from the background. I could have woven the whole thing as a flat piece, but that would have been, well, flat. 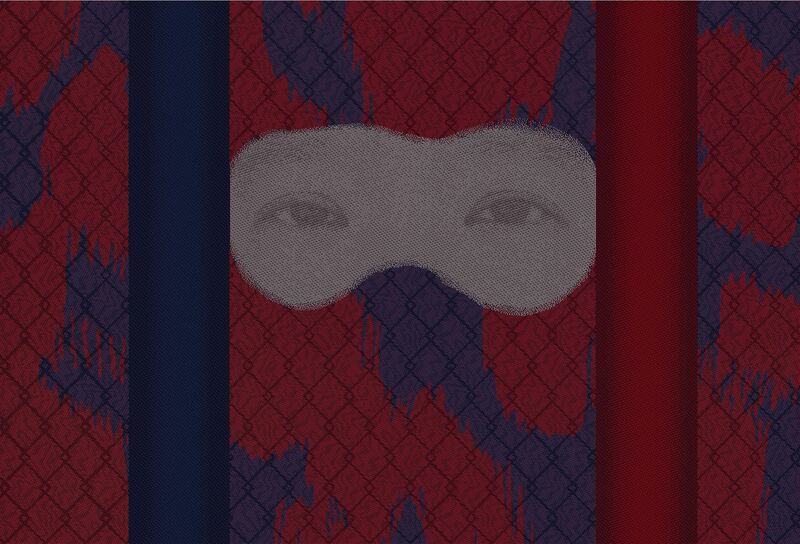 I wanted to exploit the flexibility of cloth to accent the elements I wanted to emphasize – the prison bars and the face. 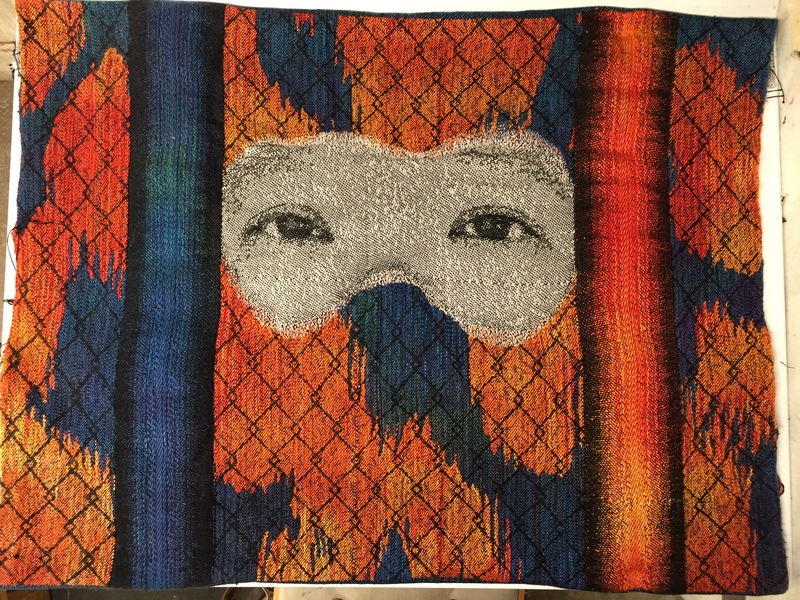 So I deliberately wove the piece keeping the layers as separate as possible, and then added layers of cotton batting behind the bars and the face. 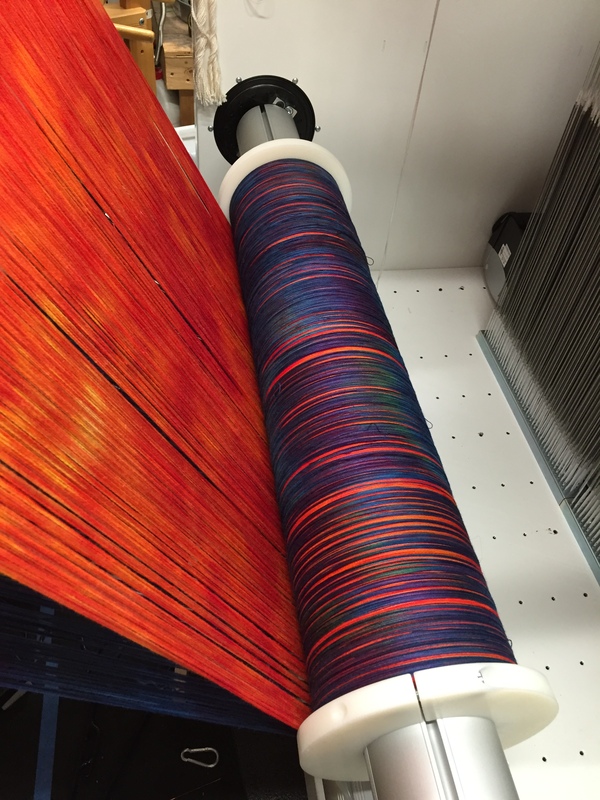 Here’s what it looked like fresh off the loom, without padding. The crinkles on the face are physical ruffles: the white layer wove up more loosely than the red/blue layers behind it, so it naturally puffed out a bit. Perfect for padding. The bars, likewise, were a bit loose before padding. So what’s left? I need to cut open the bottom layers, add the padding, add a backing fabric, and quilt around the eyes and prison bars. 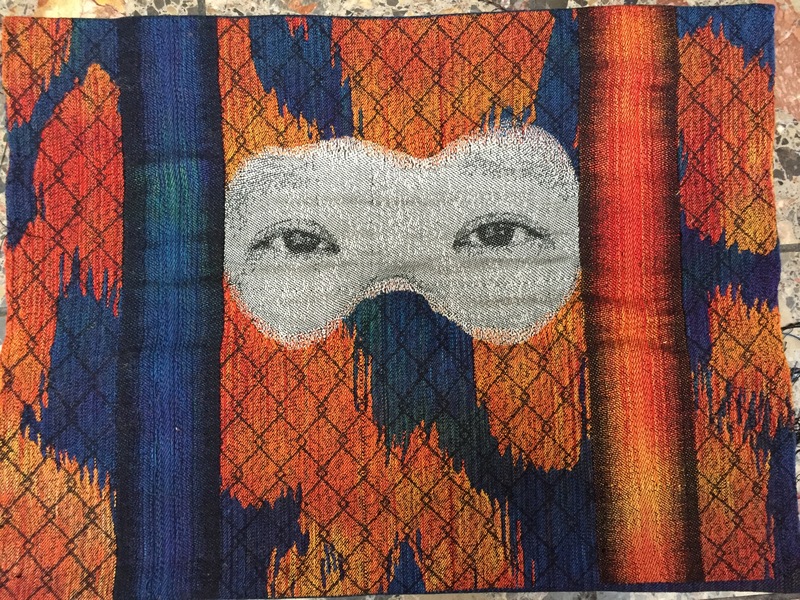 Quilting around the eyes will add depth and make the eyes more expressive. Once I’m done with that, I’ll line the piece and prepare it for hanging. And then I’ll start looking for shows to send it to. I’m still thinking about what to title the piece. “Bipolar Prison” is the working title, but I’m looking for a better one. The best I’ve come up with so far is “Inside the Prison of My Mind,” which is OK, but which doesn’t capture the bipolar disorder/mental illness aspect. If you have other title ideas, please put them in a comment or email me! I’d love help naming this piece. 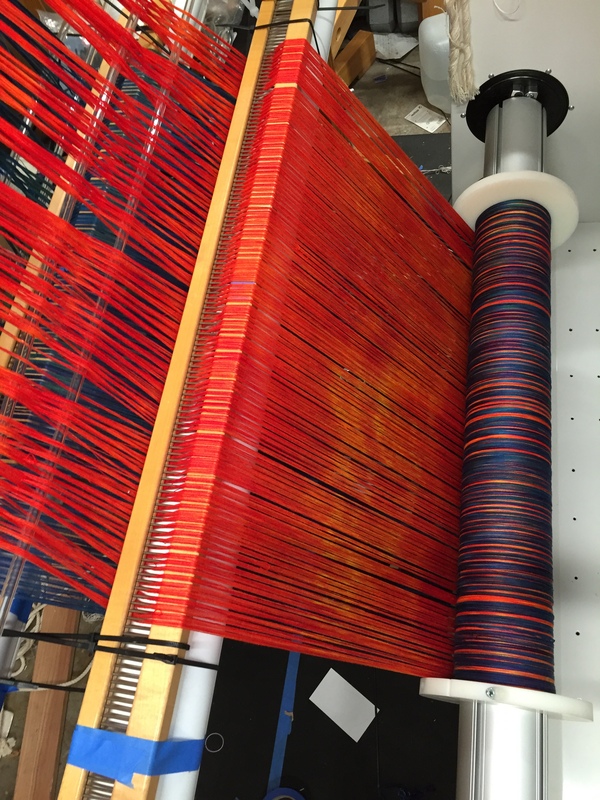 One of the challenges of textile design, especially jacquard design, is that your initial sketch is very likely going to be in another medium – pencil, paint, or perhaps a digital image. 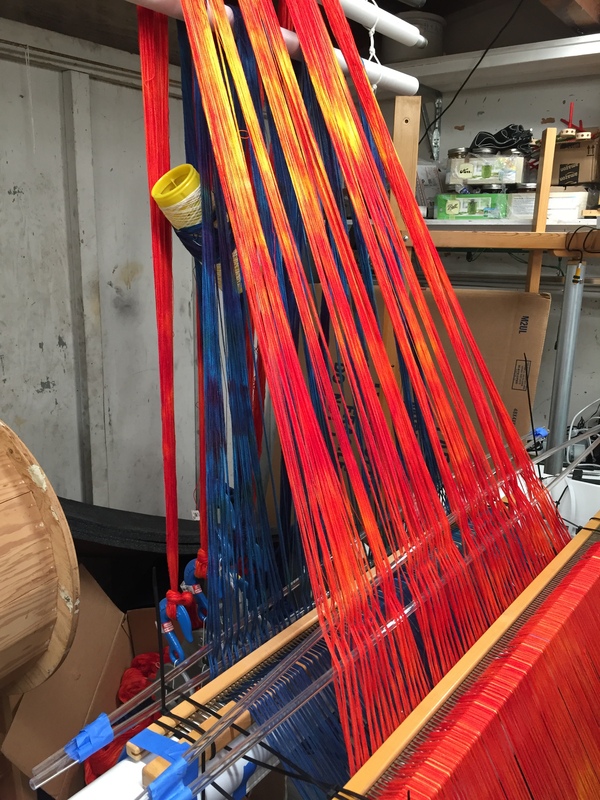 Except in very limited circumstances, designing is not done at the loom. So what’s the problem with that? Well, every medium “thinks” differently. So what you see in the sketch is not at all what you get in the finished piece, even if you work really hard at your simulation. Moreover, you don’t want your piece to look exactly like the simulation. Why? Because cloth is not paint, pencil, or pixels. Cloth has a lot more to offer: texture, drape, and luster, among many other things. One of the great challenges for me in the “Bipolar Prison” piece is figuring out how to take full advantage of its woven nature. I created the initial sketch in Photoshop, but I want to do more than just weave a digital painting, like a low-resolution printer with limited color palette. 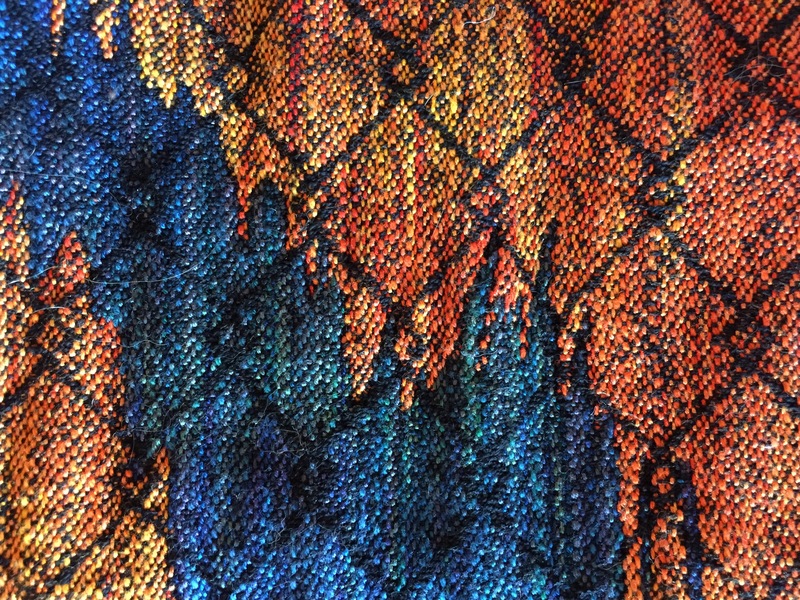 But the draw to think in pixels is so strong that it’s difficult for me to visualize textile-specific possibilities. I can’t add them to my sketch, therefore they’re invisible. And so I just don’t think of them. All great ideas, and fairly obvious to someone who is thinking in terms of woven cloth. But they just hadn’t occurred to me because I had been designing in Photoshop, thinking within the capabilities and limitations of a digital painting. This is the danger of designing in a different medium! What you see is not what you get. Without a conscious effort to think in your medium, it’s easy to lose its special possibilities, and unconsciously settle for a mere imitation of your sketch’s medium. This is the mistake I made inÂ Goodbye, Ma. The phoenix looks almost exactly like the digital painting – but it could have been much, much more. So, with Bipolar Prison, I’m making an effort to “think textile”. It’s going to be challenging, but also exciting; I hope it will produce a more interesting finished piece. I’ve started threading, but it’s a slow and tricky process. I’m threading three warps at once, from three sets of lease sticks, and because the TC-2 has fixed heddles, threading is an ergonomic nightmare. I’m using a bungee cord to hold most of the heddles out of the way, but the space created is only about four inches on either side, so there really isn’t room to thread comfortably. So I am doing it in small bits, in between rearranging the studio. I’ve also started work on translating the image to jacquard design. Translating the digital image into something I could process in Arahweave (my jacquard design software) was quite a challenge, and took several hours. My next step will be to design the twenty weave structures used in my design. That will be a serious challenge as well. Most of my time, however, has been spent on studio reorganization. I have completely rearranged the furniture in both garage and indoor studio (which meant moving a ton of stuff – literally! ), and am building more shelving in both places. I am sore in places I didn’t know I had. 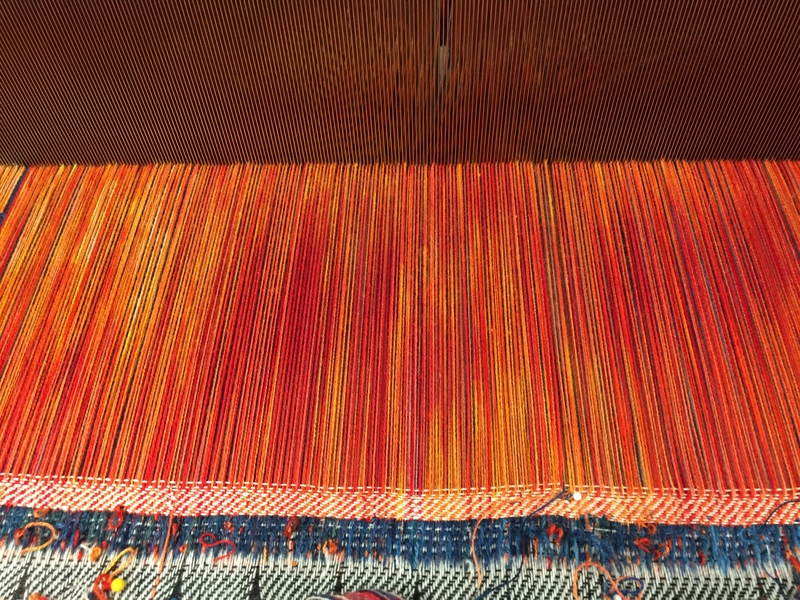 I’m estimating another week should complete the reorganization – which is great, because I’m eager to get back to weaving. The cats are starting to think that all this new furniture-building is old hat. 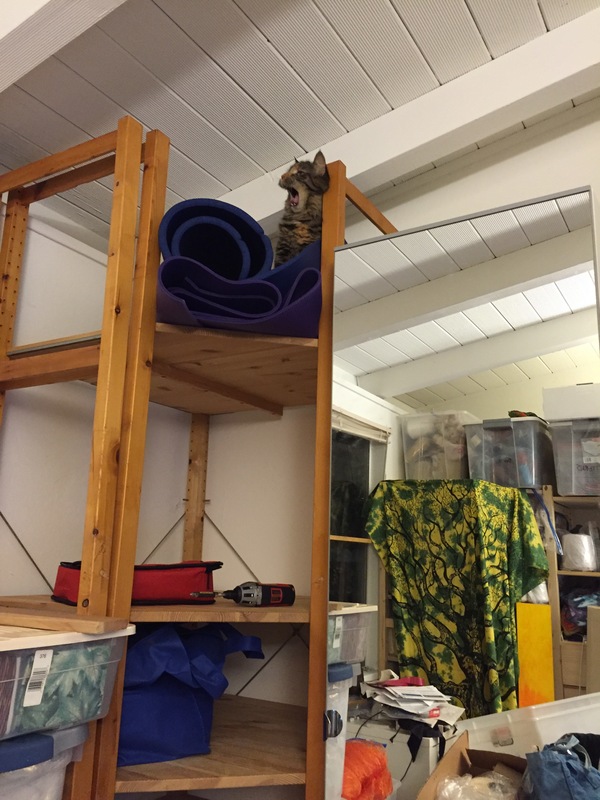 Here’s Tigress, yawning atop the shelving unit I built yesterday. Meanwhile, other major things are happening in the studio. Emmy (my 40-shaft loom) was supposed to go visit a friend for a year or so, but for various reasons that wasn’t able to happen, at least not immediately. So my buddy Alfred and I disassembled her on Sunday and have moved her into storage for awhile. That freed up about half the garage (Emmy is a big girl! ), so some major studio rearrangement is happening over the next few days. My indoor studio is moving into the garage, to be replaced with more indoor storage, another desk, and some file cabinets. And then I’m going to totally rearrange the garage. Plans are to finish that this week. So it’s been a busy week! Watch for photos, both of the new warp and the new studio.